This 12-5/8-inch x 11-inch impact-resistant, See-Through Shield provides extra protection along with your Safety Goggles and Face Shields for protecting your eyes and face from flying chips and debris during turning. 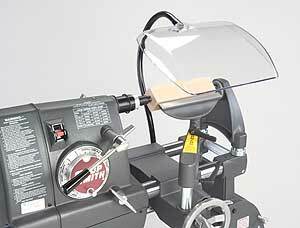 Here are PDF instruction files for the See-Through Lathe Shield. You will need to have Adobe Acrobat Reader installed in your computer in order to view/print these documents. To download Adobe Acrobate Reader, go here.